Winter is over for another year. Spring weather has the trees blooming with urgency and temperatures soaring. Yesterday we hit 31 C. Tomorrow it will rain and barely hit a dozen degrees. 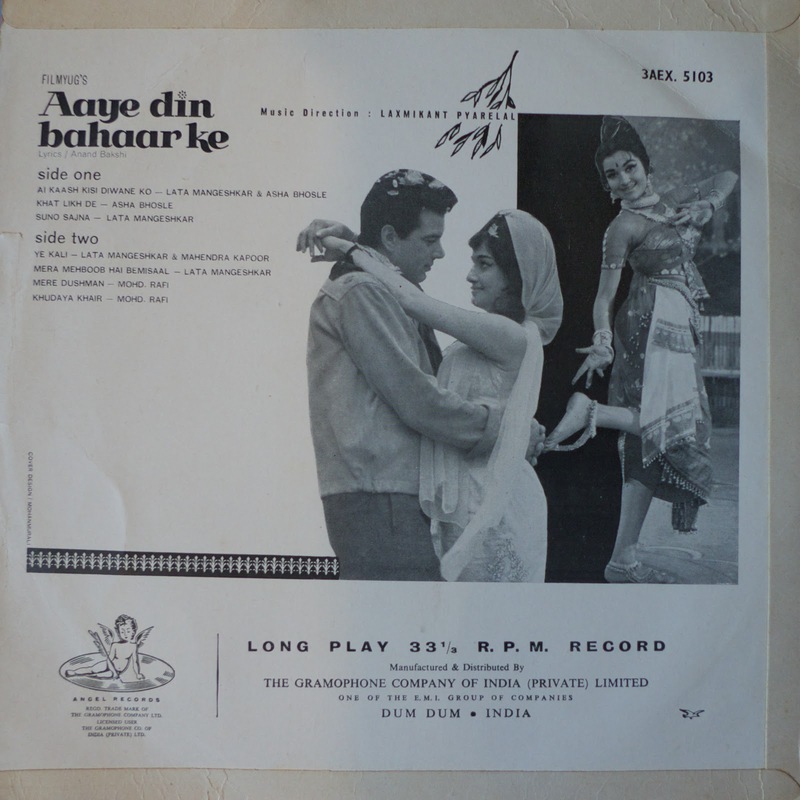 But the change of season is always a soulful time and so the Washerman’s Dog shares another stellar soundtrack from the Maestros of Mumbai : Aaye Din Bahar Ke (Days of Spring). Made in 1966 right smack dab in the middle of the Golden Period of Indian popular cinema the film was a hit for the studly action man, Dharmendra and the classy Asha Parekh. 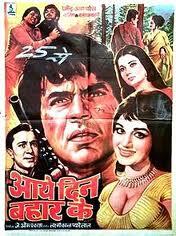 The film tells the story of Ravi, (Dharmendra) an eligible bachelor who lives with his mother. The whereabouts of his father are unknown. He meets with beautiful Kanchan (Asha Parekh) and both fall in love. But fate has other plans for them as Ravi soon finds out that Kanchan is already married and has a child. Filmed in the lush tea fields of West Bengal the mountain scenery provides a fresh atmosphere in more ways than one. Kanchan, of course, at first is not very friendly and Ravi has his work cut out for him but of course, such difficulties only mark an occasion to cavort amongst the tea plantations and beautiful flower beds whilst tugging on Kanchan’s sari! The playback singers are also at their peak. Lata Mangeshkar and Mohammad Rafi are at the summit of their popularity, with the latter in particular contributing one of his most powerful performances in Mere Dushman (My Enemies). Lata’s younger sister, Asha Bhosle, was still a few years from breaking out of her sister’s shadow and claiming top spot for herself but the two sing a nice duet in Ai Kaash Kisi Diwane Ko. 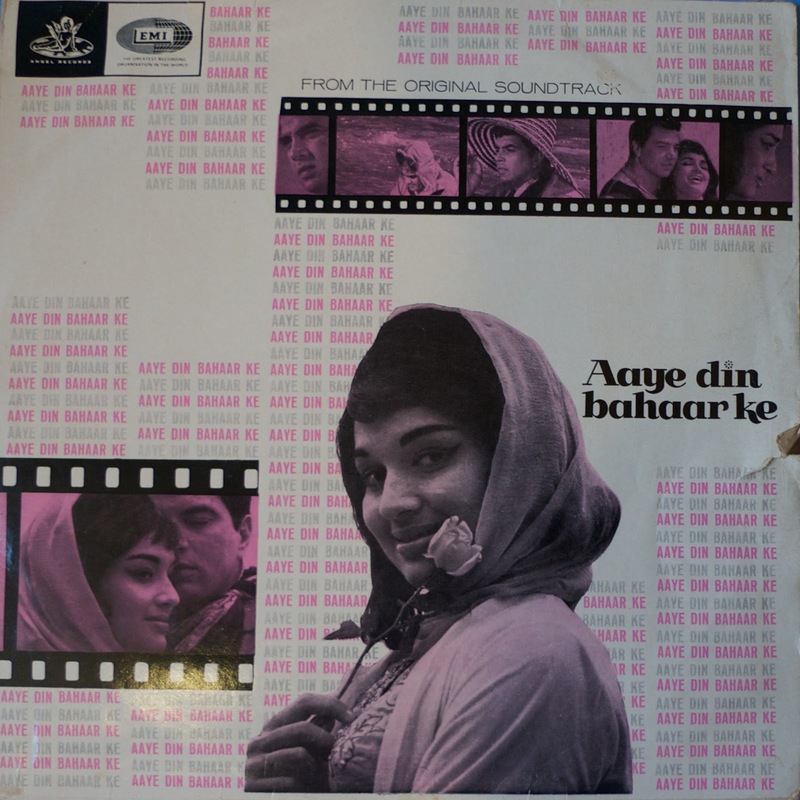 The films music was composed by the venerable duo Laxmikant-Pyarelal who not only composed specially for Lata, but had her to thank for their entry into the film music world. She picked them out of an orchestra and recommended them to Naushad, at the time the King of Composer, who gave them places in his own ensemble. The relationship between playback singer and composers remained close throughout their careers with Lata performing their songs more than any other composer/s; she named one of their songs in her personal 10 most favourite. 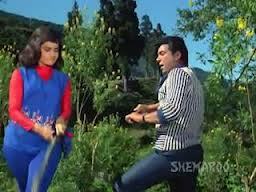 Lata’s solo Suno Sajna, for this film ranks as one of their outstanding contributions to Hindi song. Lyricist Anand Bakshi it is claimed wrote more than 4500 film songs in his long Bollywood career, most of them for Laxmikant-Pyarelal. With his inclusion, Aaye Din Bahar Ke boasted the A-Team of Bombay music. My favourite song in this soundtrack is the Mohammad Rafi number Mere Dushman. Indian film songs are famous for extolling the ways and attributes of love and the beloved in a thousand different ways. But this song, set in a nightclub, seethes with bitter anger and vengeful longings against the singer’s supposed enemies, including the shocked Kanchan. ‘My enemies, you’re going to long for my friendship/ You who’ve hurt me will long for happiness.’ Every bit as bitter and spiteful as Bob Dylan’s famous put down in Positively 4th Street. The mighty soaring strings ramp up the emotions to unbelieveable heights, and yet Rafi never loses control, indeed spitting the hurt out with style and even grace! A stunning performance.